In August 2018, Joe Timmins joined the England Talent Pathway which identifies high potential athletes for GB rowing. 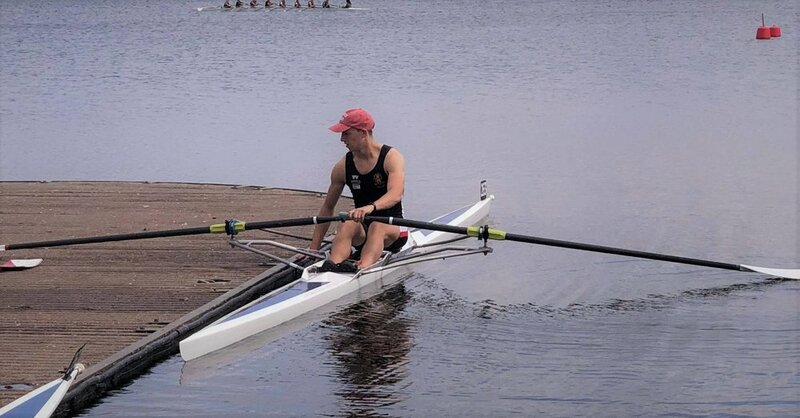 The process to enter GB pathways began with initial testing at BUCs regatta during his novice year of rowing with UWBC; including anthropometric tests and maximum force tests. Head Men’s Coach, Carl Willott, and Joe were then invited to a talent confirmation day at the Redgrave Pinsent Rowing Lake in Caversham- the home of GB rowing. Further testing included additional anthropometric measurements and max power output on dynamic weights machines. This was followed by a Schwinn bike test, testing both mental stamina as well as physical fitness, as you increased the RPM during the exercise, the bike increased resistance as the test progressed. Finally, the testing day was concluded with a 1000m rate capped erg and a 250m sprint erg. Following a successful day of testing, Joe was invited onto the BUCs sculling camp at the National Water Sports Centre in Nottingham with Carl. During this one-week training camp, the programme included extensive water sessions, land based fitness sessions as well as numerous land based technique sessions, coaching perfect ergo technique, nutrition, anti-doping and healthy lifestyle information. Only having had a couple of outings in a single sculling boat prior to the camp, this week presented a huge learning curve. Joe was able to take all that he learnt over the previous week into the British Sculling Festival at the weekend, where he was able to showcase his increased technical ability. The festival included some less conventional skills such as standing 360’s in the boat and standing rigger dips as well as more standard side by side racing, which ended up being even more unconventional as bad weather meant the conditions felt more like rowing out at sea! Since completing the camp, Joe has been linked with an England Talent Pathway Coach who works with me and Carl to further develop Joe as an athlete, offering him the best chance of progressing into the GB rowing squad. I have been supported with comprehensive training plans and information to help me fulfil my potential in later periodic testing, monitored by my Pathways coach. He looks forward to seeing what the future holds! 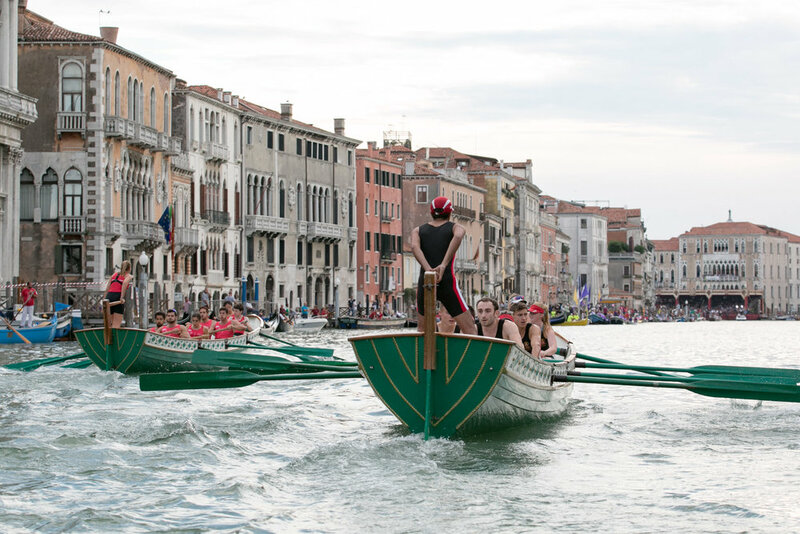 Once again this year, a mixed group from the University’s rowing team were invited to represent the University of Warwick at the Regata Storica 2018, an historic water pagaent along the famous Grand Canal in Venice. The International Universities event was especially exciting this year as it was being held in celebration of the 150th anniversary of the University of Ca’ Foscari. The invitation was met with great anticipation and excitement from all participants having heard from those who came before us of the brilliant experience we could expect. We arrived on the Friday of the weekend to a slightly damp welcome, more representative of the English weather than we had expected from Italy. Nevertheless, we were greeted with a smile by our student guide from Universita Ca’ Foscari, who set us up for the weekend ahead, ensuring we had water bus tickets to get around and found our hotels okay in the maze that is Venice! We dropped our bags off and headed out to explore our beautiful surroundings and, of course, to grab the trip’s first pizza of many in preparation for the qualifying rounds the next day! Our allotted practice time was 10.30, so we hopped on a water bus and made our way through the canals and across to the island of Giaudecca. We were greeted by some more Venice students and of course Sergio, the university’s coach. Having arrived slightly early, we had the daunting experience of watching the two other universities attending, Harvard and the University of Lausanne, practice in the traditional Venetian galleons. The boats were extremely different from anything we had ever experienced rowing in, at around 800kg compared to our boats which are fine, racing shells. However, when it was our turn, we found that they were more similar than we had originally thought, although still very heavy! After our practice session, we were pretty tired and so delighted to be greeted with a traditional Italian meal of multiple courses, enjoyed with all the athletes from the four different universities. The qualifying draw was made after dinner, composed of three rounds in which each university raced all of the others. 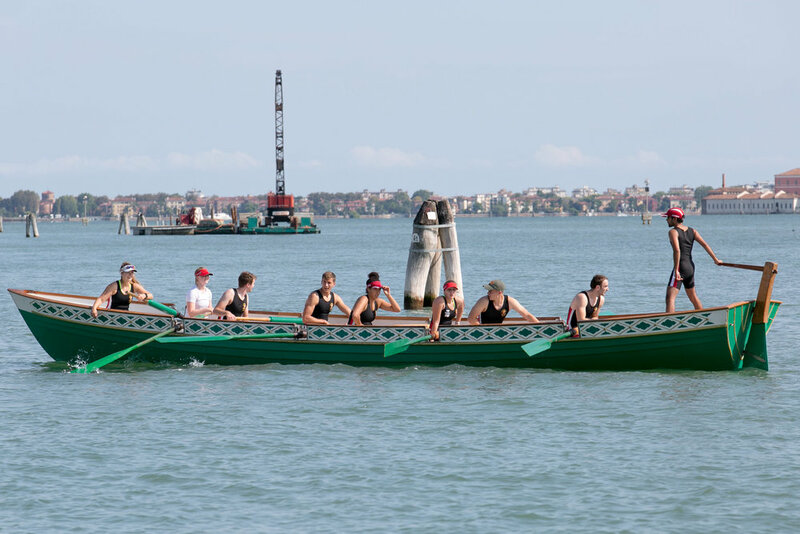 Our first race was against the experienced team from Ca’ Foscari. We knew it would be a tough race and so it proved to be; we lost out in the end but, by closely observing Venice’s race tactics, we were confident that we would be able to perform better in the next round. Next, we were up against the University of Lausanne. We rowed up to the start again, determined to get a win on the board and give ourselves a chance of qualifying for the A final the next day. We had a much smoother race and came out the winners, shaving four seconds off of our time from the previous round! We went on to beat Harvard also and therefore, were able to qualify for the A final against Ca’ Foscari who had won all three of their qualifying rounds. We were delighted with our performance, already the best that Warwick had ever achieved, but well aware of the challenge that faced us the next day: almost triple the distance against a well-drilled crew. However, we were positive that we had more to give and were ready to try to compete for first place. That evening, our amazing hosts treated us to a culinary treat with dinner at Restaurant Al Storico Da Crea. Not only was the food brilliant but the restaurant also had a fantastic view and was located in a boatyard where we got to see the famous Venetian boats being crafted! After dinner, we headed back to our accommodation to prepare for the big day. We awoke in the morning, excited and nervous for the day to come. Since our race was not until the evening, we decided to partake in some sightseeing to begin with, making the trip to Piazza San Marco, which was truly breathtaking. We fuelled up for the afternoon with pizza for lunch and then headed to Ca’ Foscari Palace for the team meeting. We were delighted to have the support of Rachel Sandby-Thomas, the University’s registrar as well as Chiara and her husband (who was fully decked out in a Warwick blazer!) from Warwick in Venice. We now had a pocket of home support to cheer us on our way, a welcome encouragement among the Venetian crowds lining the canal! The B final came first with Lausanne securing third place just ahead of Harvard in fourth and then it was time for us to take to the water. The atmosphere was truly special, with a plethora of traditional Venetian boats accompanying us down the Grand Canal towards the Rialto bridge. We turned around, lined up and were ready to go! We started strongly, using the little experience we had gained from the previous day’s racing to stay with the Venetian boat for as long as possible. However, it became evident that Venice’s tactics and experience in the traditional galleons were giving them the edge and they began to pull away, finishing ahead of us and taking first place. Regardless, we were delighted with our second-place result, well aware that it is the best result for Warwick in the seven years that we have attended the event. Just the experience of the atmosphere and sense of occasion at this historic event was enough in itself! After the race, we were able to truly appreciate the university itself, enjoying a buffet dinner in the courtyard following the presentation ceremony. It was a great opportunity to speak with both the organisers and our fellow competitors and reflect on the weekend as a whole. We would like to thank everyone involved, both from Warwick and our hosts in Venice, for making this trip possible and giving us all a once in a lifetime experience. As most of us have never had the opportunity to see the Warwick-Venice partnership in action, it was amazing to see how special it really is. The 2017/18 season began with a productive preseason, where we put away plenty of mileage to hit the ground running for what we anticipated would be a relentless season. Our first test of the season was on the tideway for Pairs Head. This saw numerous promising results, including Jake Bedford and Alex Dawson placing third in the club pairs division. As new recruits settled in, we then turned our attention to Fours Head and Wallingford Head, coming 2nd and 3rd in our division in the latter, whilst laying down two decent results at Fours Head, including 2nd in our category. After ending the calendar year on what was seen as a solid set of results so far, we headed to Reading to finish the year with a week of winter camp. Despite being snowed in for day 1 of camp, we conquered the northern-like conditions to execute a productive, exciting and hugely beneficial camp. We were swiftly back in routine in the New Year, after a few weeks at home devouring many Christmas treats, from Christmas Pudding to steak bakes. With some members of the squad carrying a few extra kilograms than before the winter break, we hit the training hard with Quintin head only a couple of weeks away. The year began with a spirited and very satisfying row at Quintin Head, having the fastest time in our division by nearly 10 seconds. Great success! 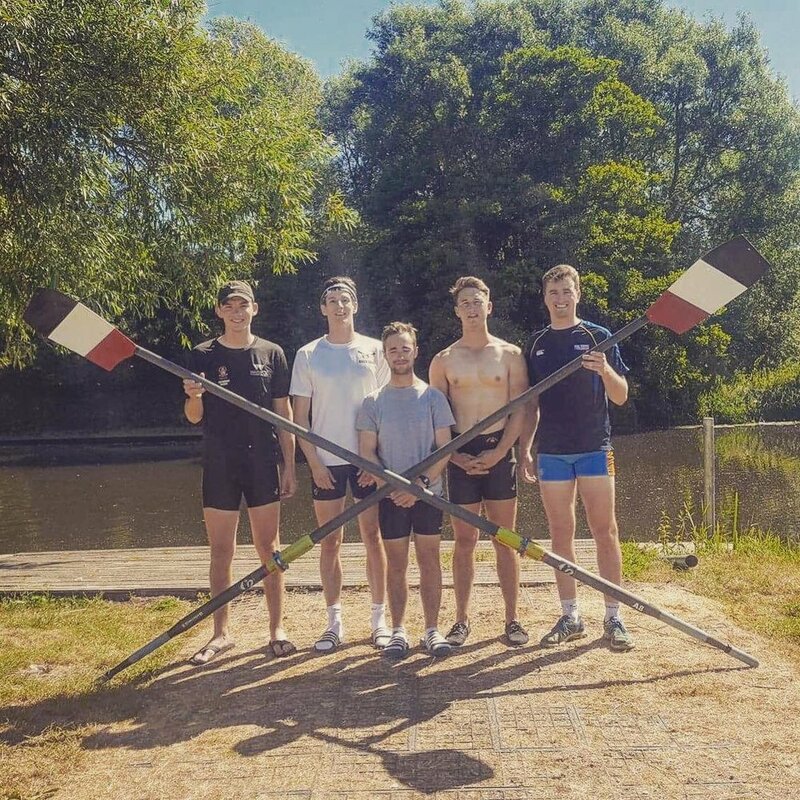 The pace exhibited at Quintin was further demonstrated at both Henley Fours and Eights Head and BUCS head on the Tyne, just under a month later. Whilst the 1st VIII trained for BUCS Head, we sent a IV to Henley where they came a narrow second in their event- highlighting the depth in the squad. The 1st VIII then took to Newcastle hoping to come back with a good result, and with 7th in Intermediate men’s eights, we weren’t too disheartened. We aimed to conclude our Head season at the Eight's Head of the River Race in the fine form we carried through the rest of the year. However, a 79th place for the first eight did not reflect our expectations, nor our ability and capability. Yet, the second eight charged to a massive UWBC second eight record which brought joy to the squad before we embarked on regatta season, but not before we went touring in Mimizan, France. Our spring training camp in Mimizan was one of the highlights of the year. After meeting a very lovely woman called Audrey and settling into our pristine accomodation for the week, we spent a week grinding out some hugely beneficial rowing with multiple boats side by side, dominating the lake (which did not contain whales, despite the club’s President, Daisy, thinking so). Metropolitan and Marlow regattas saw us placed firmly in the pack with a view to Henley qualifiers and only a couple of seconds separating us from potential Temple Challenge Cup opposition. We were around about where we ought to have been considering where we started from at the beginning of the year. 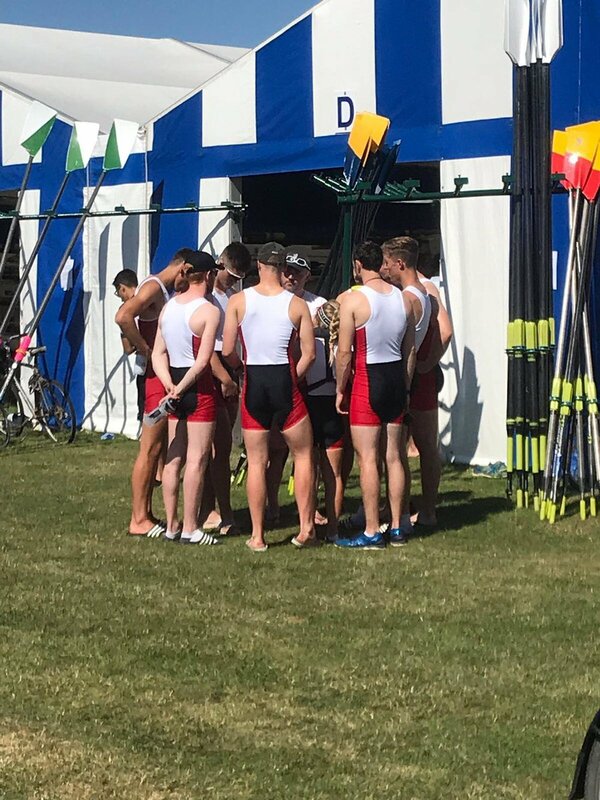 Despite slightly disappointing results at Reading Regatta for both eights, a win was seen in the four comprised of Jake, Dawson, Alfie and Godfrey (and Jude) to bring back some success from an otherwise disappointing day. Unfortunately, we did not prequalify for Henley in the Prince Albert or the Temple, which meant the beers had to wait as we headed to qualifiers on a scorching Friday morning. Spending most of the day in the shade, for the benefit of our eight’s bowman, we got ourselves in the mindset for a time trial to define our season. Despite valiant efforts however, neither the four nor the eight qualified. Flashbacks from BUCS regatta haunted the eight as they were the fastest non-qualifier. Heart-breaking. With some of the lads graduating into the big wide world, we wish them the best of luck in their rowing and professional careers. We can't wait to see our boy Bish on the Tyne! We'd also like to thank our coach, Carl, for the continuous voluntary hours he puts into the club and our captain, Jack Hutchinson, for his solid year of leadership, motivation and dedication to the squad. But also, we look forward to welcoming new recruits and those returning for the 2018/19 season, which promises to be a step up from the previous. The grind starts at pre-season on the 22nd of September. If you are interested in attending, please get in contact with us. For the second year running, UWBC senior men were cordially invited to compete in the now internationally prestigious Dresden Rowing Cup. After sampling the usual delights of budget airlines for much of Friday, the crew members found themselves enjoying the sights of Berlin and the various establishments within Dresden Central Station. Hampered by predictable transport delays, the team were eventually reunited in Dresden in the company of our guide Moritz (Big Mo to his friends). After a pleasant meal at Vapianos, the boys headed in for an early night ahead of their first challenge on German soil: a 500-metre head-to-head team erg sprint. After a gluttonous breakfast, the crew haphazardly made their way towards the location of the erg race. Whilst 500 metres is a relatively short distance by rowing standards, it’s far longer than some had spent on the erg this summer. However, any nerves over the erg were quickly dissipated when learning that the race was on RP3 dynamic ergos, allowing all shortcomings in power to be overcome by astronomically high ratings. After spending some time on the RP3’s (with the six man swearing he pulled a 1:01 split), the teams were drawn against each other. UWBC were in the third race, and drawn against Zhejiang University, China. After watching the first two heats beset by false starts and technical issues, UWBC somehow had a seamless race, powering through to a provisional first place overall with a team average of 1:22.97, with three races to go. With false starts and technical issues resuming, UWBC fortuitously held on to first, winning pole position for the 5.8k head race on Sunday. Several hours later it was race day, bringing round an early start for the crew. Practice on the course began at 10am, after some tinkering with the pristine 2015 Empacher given to us for the race. The crew quickly gelled into a slick outfit, almost as if we’d spent the year rowing together. Productive practise session completed, the crew went into lunch in high spirits, confident of a good result later that afternoon. High tide on the Elbe. 9 crews waiting and ready at the start line, blades poised delicately in the calm water awaiting the Starter’s orders. And then the off. A clean start for both ourselves, and Eindhoven in second place, quickly deteriorated into what can only be described as chaos, discord and disarray. Wash from the TV crew’s launch engulfed the boat, consuming 6 of the crew members in its icy clutch. Josh, our 7 man, caught the Elbe’s prize crustacean in the process, skewing our line and tangling us with Eindhoven’s blades. The latter recovered quickly from this melee, which could not be said for UWBC. Having taken on enough water to drown a fish, the crew set off now in 5th place in pursuit of the field. With a heavy boat and dampened spirits, the next 5km was the longest deadlift session the boys had ever done. Competing against other crews and the cox Jude’s steering, UWBC completed the race in 6th place, taking Hamburg with 800m to go. What may have initially been feelings of disappointment and frustration soon faded into a more positive reflection of the weekend. The event had been an experience new to many of the crew and we look forward to competing again next year. We've been lax on our race reports ... but they're coming back! Here is the first of the year's round ups; starting with the Senior Women. The women started with a strong and motivated existing squad; with a few Henley Women's Qualifiers returning, minus our Canadian superstar! An exciting fresh intake of schoolgirl rowers gave us some sculling experts and some strong novices quickly worked their way up into the senior squad. Things were looking good. The goal was set out early by coach, Chris Littlefair and captain, Alice Vodden, to qualify an 8+ for Henley Women's Regatta. We tackled Nottingham Autumn Head as our first race, sending three fours, before we refined our top crew for Fours Head. Fours Head saw our top four place 11th in a category of 17. Not the start we wanted, but there was space to work on a lot of things and a lot of enthusiasm and motivation within the squad. Winter Camp came next, with a solid week of work at Wallingford showing great potential for the squad. After Christmas, three 8+'s took to the water for Quintin Head. 2 weeks off and January exams took their toll on performance for the 1st 8+, but the 2nd 8+ showed our strength and depth with a fast time in their category, resulting in a place of 3rd out of 14 crews. A week later, 2K tests saw PB after PB- the fitness was there and we were ready to translate it to the water. Throughout Term 2, the squads strength in depth strengthened and individual improvements shone through. Respectable results came at Henley Head; 2nd in our category for the 1st 8+. WeHoRR was the big one; the 1st 8 came a very respectable 107th, but the squad still felt like there was more to achieve. "Here, we learned to push as a team, work as a team, everything stepped up- even the debriefs had a new ethic and determination- our intelligence became our strength- and for the first time we saw the crews trusting each other to push for every stroke". From Easter Camp to BUCS, we kept our foot on the accelerator. The 1st 8+ successfully qualified for a competitive A/B Semi Final with our best split yet. We saw a 5th place in the B final - an impressive and exciting result for us. We knew exam season was about to hit and the whole squad committed to the earliest training sessions of the whole year, intense ergs and tests, training together as a close-knit squad. We were looking ahead at Met Regatta and Henley Women's with high hopes and tonnes of ambition. We arrived at Henley, 8 underdogs and 1 cox, entirely ready for what was to come. We needed to come top 16 out of 28 crews to stand a chance of racing on the famous course. And, we did it! We drew Brookes in the first round, unfortunately, but truly enjoyed and took pride in our last race together as a crew- especially for those whose last race it was in Warwick colours. We'd like to thank Chris for his continuous support and expertise. We also cannot thank our captain, Alice Vodden, enough. She battled with operation after operation all year and managed to keep happy, motivational and dedicated- we can't wait to have you back after your year abroad! Our Henley 8+ was; Cox- Shaan Jivan, Stroke- Laura McGaffin, 7- Francesca Lidlow, 6- Orla Miller, 5- Dubheasa Lanipekun, 4- Sara Mahmad-Marshall, 3- Millie Dixon, 2- Niamh MacElvogue, Bow- Josie Parr. We're very much looking forward to the year ahead. Training hard continues over summer, ready for pre-season in September. See you then! 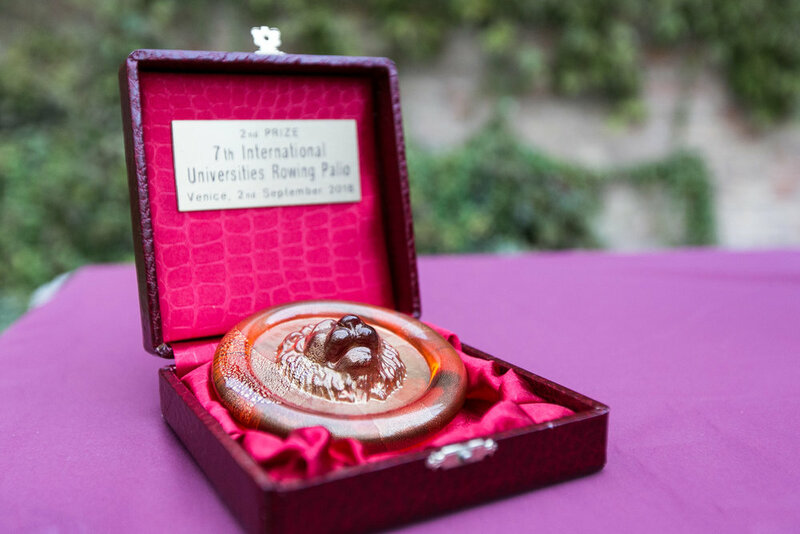 The Senior Women went head to head with some of the world's best universities for an international showcase rowing regatta in China this summer. BUCS regatta, the largest student regatta in Europe, was held over the last weekend of April at the National water sports centre in Nottingham. For the novice mens squad, this consisted of the beginners coxed fours event held on Saturday, and the beginners eights on Sunday. This was to be the first event of the regatta season, and the boys were eager to kick it off with a good result.